How do temperature and humidity affect my furniture? In general, avoid exposing furniture to extremes. Big differences in temperature and humidity cause the wood to expand and contract dramatically. Museums usually keep their furniture and wooden objects in a controlled environment with a temperature in the 18-22 degrees Centigrade range, and the humidity set to 12-20%. Direct sunlight is of course not recommended. In a private home or office, avoid placing pieces in direct sunlight and close to a heating or cooling source (near a heater or fireplace or under an air conditioner, for instance). How do I clean and maintain or preserve my furniture? Always check the contents of a product. If they aren't listed, don't use it. If one of the ingredients is a solvent such as alcohol, spirits, acetone, thinner or turpentine, don't use it. I recommend using no material at all, and just to periodically wipe the furniture with a cotton cloth. If you must use a cleaning agent, make sure it doesn't contain any kind of solvent. Such products initially give the piece a shiny appearance, but after a couple of weeks may actually destroy the finish. Instead, use furniture oil that is for periodic treatment for wood or beeswax. Can I restore my own piece of furniture? Yes. 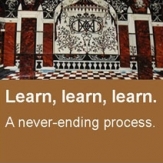 Take a look at the Workshops page for more information. If you do any work on your furniture without guidance, be sure not to hammer nails or insert screws into the joints to make them stronger. Usually such fixes weaken the joints in the long run. The proper way to fix a loose joint is to gently open it, insert hide glue, and then clamp it overnight. How do I get a price offer? 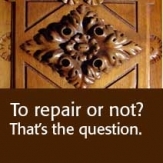 Two ways: One, you may bring your piece to my workshop and I will estimate the restoration costs free-of-charge. Alternatively, I can visit your home or office to make the estimate, for which I charge a variable fee, depending on your location. In the central region, including the greater Tel Aviv area, the fee is usually NIS 700(including VAT). 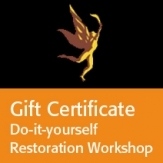 This fee is deducted from the cost of the restoration job if it materializes. Contact me for further details. How do I get to your workshop? My workshop is in Moshav Bnei Zion, a moshav north of Raanana on highway #4. Please phone in advance to arrange an appointment. See detailed description of this time-consuming and laborious process. How do I know my piece of furniture is an genuine antique? Does restoration decrease the value of a piece?